We’d love your help. Let us know what’s wrong with this preview of Eddie's War by Carol Fisher Saller. World War II. Hitler is threatening to take over the world. Eddie Carl thinks America should stop him-it's just plain right. But Eddie's just a kid, and the farm in Ellisville, Illinois, is a long way from the fighting. Ellisville: where the big news stories are gophers in the graveyard and the new bank alarm. But then America joins the war and Eddie's brother Thomas goes off to fly a bomber. Suddenly the war doesn't seem so far away. And Eddie faces more grown-up problems at home: A fire at the Strothers' place, and his gypsy friend accused of arson. Grampa Rob, all stubborn and mean. Grama Lucy with her secrets. And that redhead Sarah, who definitely likes him-unless maybe she hates him. Somehow Eddie's in the middle of it all, trying to figure out what's right. Let Thomas fight World War II. Eddie's war is right here in Ellisville. Eddie's War is a lyrical collection of verse vignettes linking Eddie, his family, and a small-town cast of Ellisvillians. Poignant and funny, this World War II story tells how a distant war affects the life of one boy in the Heartland. Learn more about Eddie's War at www.eddieswar.com, including background, discussion questions, a list of characters, and resources for teachers, including Common Core correlates. To ask other readers questions about Eddie's War, please sign up. 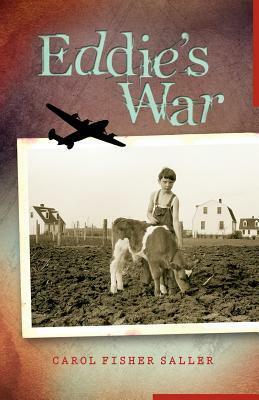 In Eddie’s War, Carol Fisher Saller explores the impact of World War II on a young boy living on a small farm in Ellisville, Illinois. It is written as a series of dated vignettes, in verse, beginning in January 1934 and ending in November 1944. Eddie Carl is the younger son of Wynton and May Carl. In January 1934, Eddie is left at the library by his older brother Thomas, while he is at the barber shop. Eddie sees a man reading the newspaper and when the librarian asks if she can help him, Eddie In Eddie’s War, Carol Fisher Saller explores the impact of World War II on a young boy living on a small farm in Ellisville, Illinois. It is written as a series of dated vignettes, in verse, beginning in January 1934 and ending in November 1944. Eddie Carl is the younger son of Wynton and May Carl. In January 1934, Eddie is left at the library by his older brother Thomas, while he is at the barber shop. Eddie sees a man reading the newspaper and when the librarian asks if she can help him, Eddie asks for a newspaper, too. Over time, Eddie continues to read the paper in the library sitting across from the same man and learning about the events that will lead up to World War II. In 1938 the man, Jozef Mirga, finally speaks to Eddie, asking him to help him read the paper to find news of his home in Poland, now that the Nazis were a threat to him family, who happened to be Gypsies. Slowly the vignettes reveal how the people around him impact Eddie’s life, influencing the kind of person he will become as he grows up. He learns a lesson in kindness when his brother is told to kill the growing baby foxes that he and Eddie had rescued, including Eddie’s favorite, Bitsy. He witnesses how Thomas’s friend Gabe does what he can do to help friend Curtis Ray after he fell out of a tree, a foreshadowing of later his heroics. He learns why his wise father refuses to give into Eddie’s begging for a gun before he is 12. And about Eddie’s long term crush on Sarah Mulberry, starting at a young age, a wise choice given her own compassionate nature. But hardest of all things is when his brother Thomas enlists after the US enters the war. Eddie idolizes Thomas and worry about him, but at the same time he is proud of his brother piloting bombers over in Europe And his disappointment when Thomas comes home and doesn’t want to talk about the war and his experiences. Eddie, like most kids too young to fight, has romanticized the idea of being in a war and wants Thomas to confirm his ideas. But, as with all wars, reality comes along and it is very different for Eddie. Eddie’s War is a not to be missed story that is a poignant coming of age look into the world of one young boy during the war. Saller based it on a diary that her father had begun as a 12 year old boy in 1944, but she says that Eddie is NOT her father, but some of the things that her dad wrote did make their way into the book as ideas. 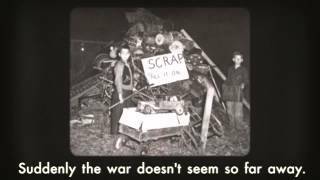 I liked Eddie’s War a great deal, partly because over time I have done quite a bit of research on home front life in the United States, both in the city and the country and I found this to be a very realistic picture of what it was like. And in the middle of all that is a young boy, trying to understand right from wrong, and understanding the courage it sometimes takes to do the right thing. Carol Fisher Saller has a wonderful website about Eddie’s War, where readers and teachers can find information about the 1940’s and World War II as well as questions for discussion. And as a real treat, there are copies of a page from her father’s diary and a letter he wrote to his older brother serving in the service. This book is recommended for readers ages 10 and up. Between January 1934 and November 1944, Eddie Carl grows up. When Eddie is very young, he discovers newspapers from various cities in the public library. Soon he feels as if he knows a lot about the wide world that exists beyond his dad’s corn fields in Illinois. But no one else seems interested except Jozef, a gypsy who studies the newspapers, searching for the name of his hometown in Poland where his family, including a son, still live. Eddie feels a connection with Jozef that forms a strong t Between January 1934 and November 1944, Eddie Carl grows up. When Eddie is very young, he discovers newspapers from various cities in the public library. Soon he feels as if he knows a lot about the wide world that exists beyond his dad’s corn fields in Illinois. But no one else seems interested except Jozef, a gypsy who studies the newspapers, searching for the name of his hometown in Poland where his family, including a son, still live. Eddie feels a connection with Jozef that forms a strong thread, woven throughout this poignant story of growth and discovery. Although Eddie is convinced that somebody needs to stand up to Hitler and his followers, he realizes that it’s not so easy to go against the prevailing sentiments of your community. Even his mother thinks the dreadful news from Europe is just rumors, and his father says it’s best not to get involved in others’ business. Life is complicated for a thoughtful kid like Eddie who tries to sort out right and wrong close to home as well as far away. He wonders why his grandfather is so over bearing and sometimes mean. He is puzzled also by other family secrets. But he welcomes several gentle lessons in wisdom and compassion. When his older brother, Thomas, decides not to kill the fox kits as instructed by their practical father, Eddie questions him, and Thomas admits that their father is right, but quietly asserts that he and Eddie are right, too. Eddie’s classmate, Sarah Mulberry, shares her money with a gypsy girl who seems to have lost a quarter for the movies. And it’s Sarah who tells Eddie when Jozef is arrested for arson. Eddie tells his story in spare prose with a light touch of humor. The month and year at the beginning of each short chapter give the impression of a journal. The sentences are broken into logical segments and arranged almost like poetry. This type of formatting is used here just as effectively as in Virginia Euwer Wolff’s highly acclaimed Make Lemonade trilogy. This book presents an honest account of one boy’s distant view of WWII. After his brother Thomas goes off to fly a bomber, Eddie is still at home, fighting his own small war -- until finally he finds his voice and the courage to say what needs to be said. I quite enjoyed this book. I confess I didn't used to read much poetry, not that I hate it, but there were just other genres I liked better. As I've grown older though, I've branched out, willing to try things I haven't read before. I've been lucky so far, in that, the verse novels I've read have been especially good ones. This book joins that list. I think one of the things I enjoyed the most was the way Saller put her words together. Each line created a picture in my mind as I read, each addit I quite enjoyed this book. I confess I didn't used to read much poetry, not that I hate it, but there were just other genres I liked better. As I've grown older though, I've branched out, willing to try things I haven't read before. I've been lucky so far, in that, the verse novels I've read have been especially good ones. This book joins that list. I think one of the things I enjoyed the most was the way Saller put her words together. Each line created a picture in my mind as I read, each additional line simply added to the picture created by the very first line of each poem. Each poem tells a story in its own right while at the same time, each poem added to my understanding of Eddie and his friends and family. I greatly admire those writers who can so fully create characters that are easy to relate to and that I care about from page one. Writers who can do this with a minimum of words and in what could be a limiting format amaze me. Saller definitely goes on that list for me. She does a fantastic job of creating setting and plot. I enjoyed seeing Eddie grow up, the mishaps and excitement of youth, and the confusion that often accompanies growing up and realizing that life in many cases is not black and white, but gray. Thanks, Ms. Saller for allowing me the privilege of watching Eddie grow up. Highly recommended. I must admit that I entered this book skeptically seeing that it was laid out in what looked like verse and my skepticism increased as I realized how short each chapter was and how short the book overall was. How could it possibly develop any characters or themes with such little time? Well, if you saw my star review up there, you'd see that Saller succeeded admirably and left me blinking back some tears because the characters did get under my skin and make me care. This book is a historical nove I must admit that I entered this book skeptically seeing that it was laid out in what looked like verse and my skepticism increased as I realized how short each chapter was and how short the book overall was. How could it possibly develop any characters or themes with such little time? Well, if you saw my star review up there, you'd see that Saller succeeded admirably and left me blinking back some tears because the characters did get under my skin and make me care. This book is a historical novel set in small-town Illinois before and during WWII. Eddie is just a young boy living on a farm with his family but over the years he sees some things. Such as the Polish gypsy Jozef who is viewed with suspicion by the neighbors; such as his abusive grandfather; such as his older brother and friends going off to war; such as the mysteries of girls; such as standing up for what is right. This book touches on everything; some books would cover the same events in 500 pages and not pack such an emotional punch. The humor, the sadness, the randomness of life all conveyed in this small package with lovely writing. And it left me with tears in my eyes from the feelings it evoked. Somewhat sadness over some of the events, somewhat sadness that the book was over, but mostly happy tears over a sweet story. Overall: Highly recommended historical fiction novel for all. I love historical fiction and what made this novel unique is that it's written in verse. Eddie Carl is not old enough to fight in WWII, but we see the war through his eyes when his brother, Thomas, becomes a pilot. For me the most heartbreaking part of EDDIE'S WAR is the relationship between Eddie's Grama Lucy and his grampa. Grampa blames Grama Lucy for their daughter's death many years ago and is physically abusive. The first time he hits her in the book catches both young Eddie and the reader I love historical fiction and what made this novel unique is that it's written in verse. Eddie Carl is not old enough to fight in WWII, but we see the war through his eyes when his brother, Thomas, becomes a pilot. For me the most heartbreaking part of EDDIE'S WAR is the relationship between Eddie's Grama Lucy and his grampa. Grampa blames Grama Lucy for their daughter's death many years ago and is physically abusive. The first time he hits her in the book catches both young Eddie and the reader by surprise. The author did a masterful job with these scenes. I have thoroughly enjoyed Saller's sensitive story of friendship, growing up during the 1940's. This historical fiction is easy to read, yet it's laced with deep moral issues that bring great appreciation for that time in history. I would highly recommend this as a companion to the study of WW2 because the insight into what middle grade kids were talking about and their thoughts about war. Making comparisons and correlations would lead to some great discussions. It has inspired me to take some t I have thoroughly enjoyed Saller's sensitive story of friendship, growing up during the 1940's. This historical fiction is easy to read, yet it's laced with deep moral issues that bring great appreciation for that time in history. I would highly recommend this as a companion to the study of WW2 because the insight into what middle grade kids were talking about and their thoughts about war. Making comparisons and correlations would lead to some great discussions. It has inspired me to take some time to find out about my father-in-law's childhood. He lost a brother in the war and I would love to be able to share those priceless stories with my children. Free verse account of life on the home front during WWII. Even though a war in Europe seems far away at the beginning of this story, we see how it can effect even small town America. And soon, Eddie has an older brother and a friend serving in the war and a neighbor who is a gypsy and has family in Hitler's path. Through Eddie's sensitive eyes we learn that doing the right thing is everyone's problem, everyone's responsibility, everyone's battle. Eddie's War is a short and quick read about growing up in small town America around the time of WWII. Eddie, his friends and family are all well rounded characters in the story which provide a glimpse of the feelings in America as WWII is beginning. The fear, prejudice, and pride shine through each short chapter. It reads at a fast pace and would make a great library addition for middle school reluctant readers. I was not prepared to like this books so much! This novel in verse tells of Eddie's life before, during, and after WWII. The narrative is sparce, and meaningful. Saller lets the reader feel as if she is meeting her characters in person. I found myself both laughing out loud (the rifle firing story in the beginning with his father) and crying as friends of his died in the war. Although the story is set historically, in WWII years, it is easy to relate to Eddie and his world. This novel in verse covers ten years in Eddie's life, from his childhood in 1934 through his adolescence in 1944. It also covers his growing awareness of the war in Europe. His older brother enlists and becomes a fighter pilot; another neighbor dies on the battlefield. The small Midwestern town is a microcosm of the shades of opinion and responses to World War II on the home front. Beautifully done! And I don't just say that because the author is a friend & work colleague. This is a really well-crafted YA novel set in the 1930s & 40s in central Illinois. It's formatted in broken lines resembling poetry, but I think the cover description, "lyrical collection of prose vignettes," is probably the most accurate way of categorizing it. Much is done with spare, taut language. This review is based on an e-galley from Netgalley.com. This sweet story was a surprising treat of historical fiction. Saller has a unique style that tells Eddie's story in just the right way. I love how each short chapter is centered around one event and expresses the experiences of Eddie growing up in his small home town around the time of WWII. A great read! I like books written in prose. This book is a snapshot of a dozen years of a boy's life in rural Illinois. The prose gives a warm picture of Eddie's home life, farm life, his extended family, his friends, and the circumstances of life on the homefront during World War II. The story, told in verse, of pre-teen Eddie during World War II. He tells the story of his brother and friends going off to war, and prejudice against people who are different in his small Illinois town. Loved this book! All of the short little vignettes add up to one big story about Eddie, his family, and their small community during world war two and the days leading up to our involvement. Some of the little stories would be interesting to use with common core reading! I loved the freedom of using poetry rather than prose. It told the story just as well and gave it a different tone. simply beautiful writing, and horray for the rural Illinois setting! This will be a good recommendation for the reluctant reader who must read an historical novel. Good storytelling, good characters. It is a quick read but has depth. Well done. Cute book. Still not entirely sold on the "lyrical prose" aspect of it but it was a good story. I loved this book .... but then I'm a WWII nut AND adore poetry. Not sure if kids will be as excited by this book as I was. “Eddie’s War” by Carol Fisher Saller is a fantastic and intriguing book.. This book is written about World War Ⅱ. Hitler is threatening to take over the world and Eddie thinks America should stop him. But Eddie is just a normal boy with no magical power who lives in Ellisville, Illinois with his family. But he couldn't do anything about it and he felt far away from war. But then his brother Thomas goes to fly a bomber in the war so suddenly the war did not seem far away. While he has many proble “Eddie’s War” by Carol Fisher Saller is a fantastic and intriguing book.. This book is written about World War Ⅱ. Hitler is threatening to take over the world and Eddie thinks America should stop him. But Eddie is just a normal boy with no magical power who lives in Ellisville, Illinois with his family. But he couldn't do anything about it and he felt far away from war. But then his brother Thomas goes to fly a bomber in the war so suddenly the war did not seem far away. While he has many problems to go against he tries step and step to solve the problems. I chose to read this book because I interviewed my grandpa about World War Ⅱ in the the Historical narrative project, and I wanted to know the perspectives of the people who were against us in the past and how they felt in the war. I also thought because I know how the Japanese people felt in war I could make more connections and see the differences or the similarities. This was the first poetry book i've read in my life and I was really impressed because I thought the book will be boring and have no story, because they just write poems. But when I started reading the book, I was so surprised, there was a lot of emotion, even if they were just poems, each poem had a story and they connected to each other. I just got into it so much I would always want to make time and read the book. What I enjoyed about this book is that the book gives you an idea how to write a poem and improving your piece, while telling you all the history and the feelings they had. I also loved how the author connected all the stories by using the poems, and I thought that would be a very hard thing to do because, if you don't feel strong enough you would not make a good poem. But the author putted in strong emotion in every single poem and that means it was that important and she had a strong feeling about it. The parts I was disappointed by this book is that this book did not have a introduction about what she was going to write about. So I was really confused what I was reading about in the beginning because she just started right away with a poem. I think what she could have done is write a quick introduction and start the poems. After reading the book, I thought both in Japan and America the civilians who didn't go to war had the same feelings in their head. Their child went to war and the parents will worry all day long and wait for letters to come. They wanted to stop war then losing their children. I also thought that the people who went to war had the same feeling but at the same time I think they wanted to win and be proud that they went to war and contributed for the victory. The feeling that strongly thought was that every single person felt fear somewhere in their minds. Even the size of the fear was different for every person they felt fear. From thinking all about the feeling they had during war this book made me think about war more seriously. And made me think more deeply into war. I would recommend this book to anyone. But I strongly recommend this book to people who wants to know about war. You might think the book is boring but I think that you would keep on going until you finish the book and end up reading it over and over. I didn't have any suggestions because then why would I rate the book 5 stars. I would be able to write an whole essay about this book and how I felt. This is how strong I feel about this book and this book had changed my life and how I think about war. I loved this book and I would definitely read it again because from all the thoughts I had I think I would have a different opinion or emotion when I read it again. This review has been hidden because it contains spoilers. To view it, click here. Eddie is a farm boy who follows his older brother and his crowd of friends around like a seagull after fish. As the novel is written in prose/short verse from Eddie's point of view we learn about his life on the farm and his small town of Ellsville. Eddie befriends a farrier at the local library who is discovers from his Grandmother is a gypsy. She forbids him to speak to him anymore, and of course Eddie only seeks out his new friend even more. Life is turned upside down for Eddie and his family Eddie is a farm boy who follows his older brother and his crowd of friends around like a seagull after fish. As the novel is written in prose/short verse from Eddie's point of view we learn about his life on the farm and his small town of Ellsville. Eddie befriends a farrier at the local library who is discovers from his Grandmother is a gypsy. She forbids him to speak to him anymore, and of course Eddie only seeks out his new friend even more. Life is turned upside down for Eddie and his family when his older brother enlists in the air force after Pearl Harbor. The book has a fast paced and covers a decade or so in short order, so that we are able to see Eddie grow up and deal with issues in his family and town. Namely, the spousal abuse of his Grandmother and the witch hunt for his Gypsy friend after a silver button of his is discovered at the site of a fire. A good read for upper elementary/middle school readers. Literary Quality: The greatest strength of this book is the richness of its characters. The inclusiveness of Eddie's family and the community add a diverse quality to the book. The plot moves along at a rapid pace. Readers will appreciate this, but it left me wanting more. Originality of Text/Illustration: The text is original in its format and ability to include years both pre-war and immediatley post-war. Also, a midwestern boys perspective of WWII is a nice change. There were no illustrations. Clarity/Style of Language: The author was able to craft a very clear and succinct novel in the verse style that was used. Details were rich and left no room for doubt. Organization/Accuracy: The novel was written in chronological order. No errors were noted. Each entry was given its own title, helping to seperarte parts and more less create chapter breaks. Subject Matter Interest to Children: This novel be interesting to students 5th grade and up. For those without a midwestern background or knowledge of WWII it may fall flat. Likliehood of acceptance by Children: See above. This spare novel is packed full of charm. What most writers need pages and pages for, Saller can convey in mere paragraphs. The short chapters Saller presents focus deeply on a given moment....some of these moments made me laugh out loud, some made me hold my breath, and others made me cry. The language is beautiful, each word carefully chosen. Eddie's War is Eddie's own tale of life during a confusing time. And while Eddie lives in a small town, where he believes nothing ever happens, there exi This spare novel is packed full of charm. What most writers need pages and pages for, Saller can convey in mere paragraphs. The short chapters Saller presents focus deeply on a given moment....some of these moments made me laugh out loud, some made me hold my breath, and others made me cry. The language is beautiful, each word carefully chosen. Eddie's War is Eddie's own tale of life during a confusing time. And while Eddie lives in a small town, where he believes nothing ever happens, there exists complexity - prejudice against the gypsy community and specifically the character Jozef, worry over the war, concern for the young men who head off to battle, including Eddie's brother Thomas, and even the ups and downs of young love. Saller's tenderness comes through in the story in Eddie's relationship with Jozef as well as his thoughts about his brother. A decent understanding of WW2 history is likely helpful for any younger readers--keeping track of the dates for each vignette makes the story much easier to guess at and follow. Style is a bit awkward at first, but reads well enough like a story. Not exactly sure why the author wanted to use poetry for prose, other than perhaps to move the story along faster? Eddie's war is a story that begs to be read in one sitting. The diary-like entries are brief enough that I couldn't stop myself from reading "just one more" and, though each one felt self-contained, they connected in myriad ways, illuminating and deepening the events of the others. I can't believe how much story is packed into such spare verse. I cheered, mourned, felt indignant, and even laughed out loud while reading it. Eddie's War has everything I ask for from a novel. Eddie's War is a wonderful book. Set before and during WW II in a small town in Illinois, it follows young Eddie as he confronts a host of problems in his family and the community. The writing is crisp, the dialog authentic, and vignettes that make up the many short chapters are frequently funny. The book is geared toward young readers, but is rewarding for adults. I highly recommend it. The book is scheduled to be released August 1, 2011. I am not really a fan of historical fiction or a fan of verse and this book is both. That being said, I did not hate this. Which is actually quite a compliment. I can see the appeal, especially for people who are fans of those genres. Carol Saller grew up in Peoria, Illinois, and as an adult moved around for some years before settling in Chicago. She works at the University of Chicago Press as editor of The Chicago Manual of Style's online Q&A, which led to her write The Subversive Copy Editor. Eddie's War is her first novel for children. Set in rural Illinois during World War II, its collection of vignettes portrays a young Carol Saller grew up in Peoria, Illinois, and as an adult moved around for some years before settling in Chicago. She works at the University of Chicago Press as editor of The Chicago Manual of Style's online Q&A, which led to her write The Subversive Copy Editor.